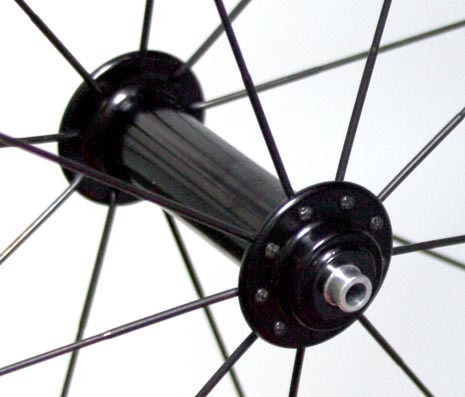 New in 2009, Nimble's 65 gram front wire spoke style hub is used in the FLY and Spider wheel. The bearings are precision sealed cartridge style for great rolling resistance, low maintenance and durability. This hub has an extra wide flange spacing that enables lower spoke count wheels without a loss in lateral stiffness and stability. It has larger diameter bearings with three times the static load rating of our previous hub at no cost in weight. It has an oversized alloy axel that further contributes to built wheel lateral stiffness and stability. See pricing.